BG Note: The star of We Need To Talk About Kevin, Fantastic Beasts and the upcoming Flash movie is featured in the cover story of the November 7, 2018 issue of The Hollywood Reporter. This bleeds into Miller’s own #MeToo moment, which he has never shared, with an unnamed director and producer. BG Note: You can read the entire article here. 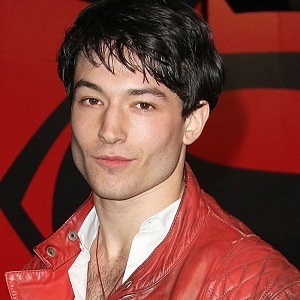 [Optional] Ezra Miller chose to wear a rather unique outfit to the premiere of the new Fantastic Beasts movie. Describe Ezra’s look in five words or less. No clue who the sleazy director/producer was. Never thought about him much before, but I * love him now. Brokeback mountain by Ang Lee? A black plastic Christmas tree. Ezra’s look: Pure camp. Like, he could drop everything and be roasting marshmallows at a moment’s notice. Miller was probably 15y.o. at this time, ant the story is gross. anything inappropriate, but were I a betting man I would go with your guess. Optional – Glad garbage bag meets Dalek! Good for him! Don’t know much about him, but this item makes me want to learn more. And he’s freaking adorable!! But Credence was pretty creepy! No, Miller was in his early 20s when Stonewall went into pre-production. Could the film be Milk? He would’ve been sixteen so definitely underage. I’m guessing this is the 2008 movie “Milk,” with the clue in the Similar. I’m sorry that happened to him. He sounds kind of unhinged, so maybe it affected him more than he admitted. I’ll describe the outfit in three words: desperate for attention. I don’t like filthy language, so I couldn’t even get through the blind….total turnoff! Stonewall was announced in 2013. Ezra would’ve been 21 at the time, not underage. Why is this pedo still working at all? Should be in jail with serial pedo Dan Schneider!!!! Antonio Campos who co-founded BorderLine Films that was the production company for the film. “Dalek with a face.” – You win the Internet for this one. 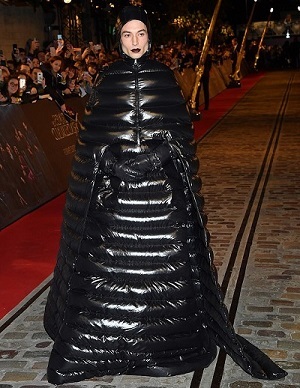 That is either a Moncler coat or creature from Stranger Things! Movie – Stonewall with Roland Emmerich as producer/director. * weird. Dude has some serious issues. Also, when will the metoo movement uncover the obviously huge pedo problem in Hollywood? And they wonder why we think they’re elite grandstanding is *. I’ve been wondering about this too. Even before the #metoo movement. i’m afraid i have no guesses, but am glad it would appear that #timesup for these predators and abusers! No idea about the blind, but that Pictish Edward Scissorhands meets Michelin Man! Drawing a blank on director or producer but I think that get-up makes him look like a goth potato bug. Bryan Singer did two movies which fit the time period – Vito and Color Me Olsen. No idea about the blinds but I will describe the fabulous outfit worn by Ezra: Noir Couture Trashbag PuffyParka! Kudos to him for forging his own path. I can’t figure out if underage means under 18, or under 21 (not legal to drink) so it’s hard to narrow down a timeline for the movie. But the culprits sound any awful lot like Gus Van Sant &/ or James Franco, who did multiple projects, together and separately, that could fit the theme. L.L. Bean meets Geoffrey Bean. No idea but he looks like a peeved hornet! Oh, brother. ???? my eyes were rolling so hard reading this, they almost got stuck. Outfit is Goth Alice in Wonderland catapillar. Was he auditioning for the part Emile Hirsh got, or Diego Luna’s? We don’t even know if this movie was ever real, got made or was just an excuse to have meetings with tipsy underage boys. Because we know that it has NEVER happened before like that. Ever.